An upright, fernlike perennial specimen in our hillside herb garden had me stumped since it began sending up new shoots of greenery a couple of months ago. 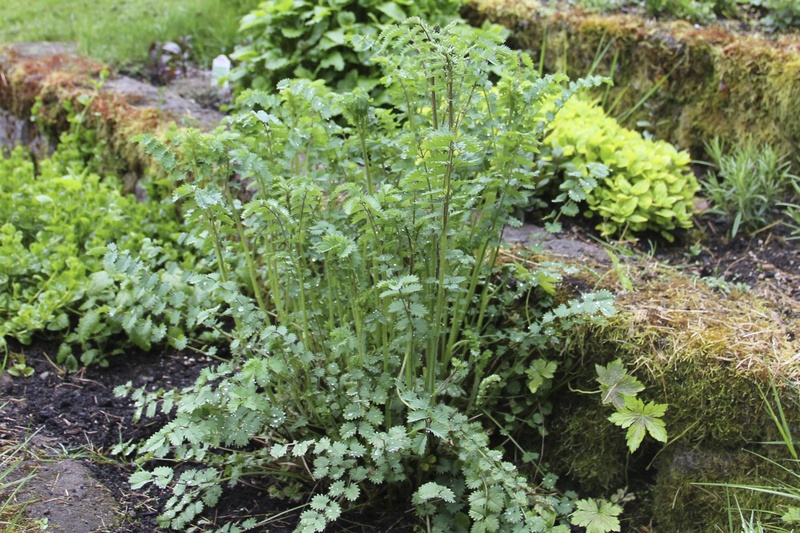 Its appearance brings to mind a cross between parsley and maidenhair fern. I waffled between thinking it was a weed and thinking it was strictly ornamental, or a flower of some type. I couldn’t identify it by scanning herb packets at garden stores, by reading my gardening books, or by briefly searching for “fernlike herbs.” When I tasted it to try to place it, I recognized a mild cucumber flavor, but not much. 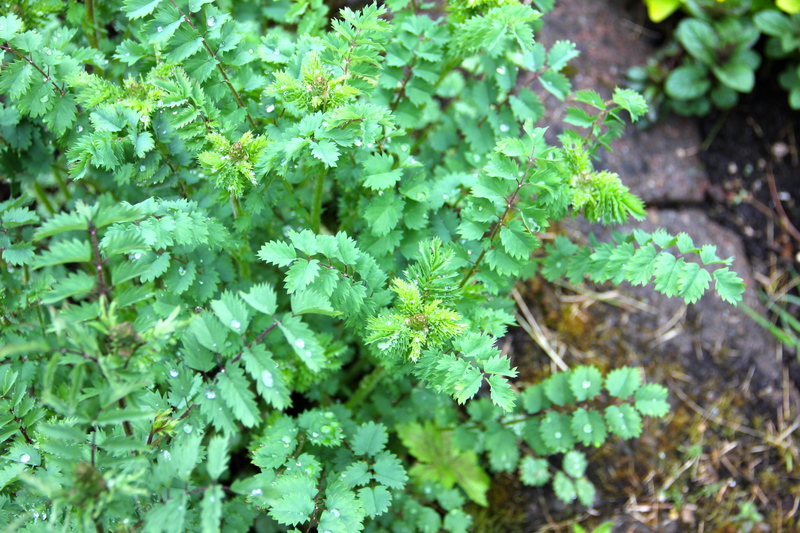 With the help of the internet and continued researching in yesterday’s wet weather, I can now introduce salad burnet — Sanguisorba minor! Its scalloped leaves are indeed grown for a delicate cucumber flavor, which makes it a great addition to green salads, as the name implies. It is best eaten fresh and does not dry well. Youngest stems have the tenderest leaves, and flavor is improved by removing older stems and flowering stems, which are just budding here at Coppertop. I can also imagine it in tea sandwiches and as a very pretty garnish in summery beverages. I’ve read that a puree of the herb can be swirled into mild soups to add a lovely touch and a tangy finish. I’ve learned that although salad burnet is not well known today, it was commonly grown in medieval kitchen gardens and was used medicinally to heal wounds and protect against the plague. In Elizabethan times, the herb was used to garnish glasses of wine. Sanguisorba translates as “drink up blood” referring to burnet’s use to prevent hemorrhages and internal bleeding. Hundreds of years ago, soldiers would drink a tea made from the herb before going into battle in hopes that wounds they received would be less severe. This entry was tagged Coppertop, fernlike, gardening, herb garden, kitchen garden, Olympic Peninsula, salad burnet, sanguisorba minor. Bookmark the permalink.